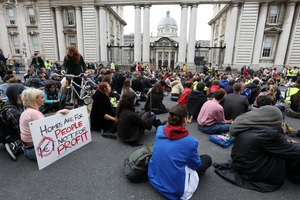 Students stage a sit down protest outside the Department of the Taoiseach to highlight the housing crisis. 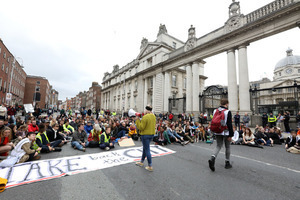 Students from across the country demonstrate against the housing crisis as the Dáil meets. 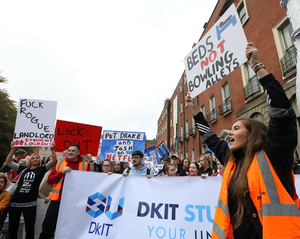 Posted in Misc and tagged Housing crisis, Students at 1:23 pm on October 3, 2018 by Bodger. I haven’t seen Landlords Cheat USA II, do i need to have seen Landlords Cheat USA before i watch the sequel? what a pathetic individual you are. Have some self respect. 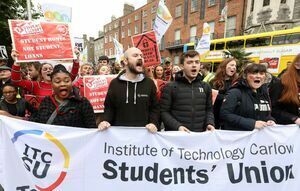 Well done to all of the Students marching. Its great to see. 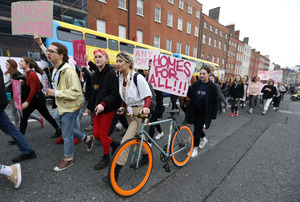 Can you imagine trying to go to college in Dublin with this Housing Crisis? How would they survive? I’m a landlord and I’d hate to think I cheat my tenants. We’re not all bad. True. Not all are bad, in fairness. But I worked in the property market at one point and I met a fair number of landlords who were just gougers plain and simple. I just got out of being a landlord myself. I can finally sleep at night now. Not worrying about financial ruin knocking on my door. I got into it purely because I couldn’t sell my house without making a massive loss. But I had to move due to reasons I won’t go into. I rented the place out at below market rate just to cover the mortgage and any possible replacements or repairs that might come up. Being naïve as I was , it was only after did I realise I hadn’t thought about the income tax. So the plan to just break even was out the window. I was hammered for income tax. Fair enough , I didn’t do my homework but I paid what I owed. The mortgage got paid , the tax got paid and any repairs were sorted immediately. All the while the tenant was getting a decent deal on the rent. Things finally turned around in the market and I could see the light at the end of the tunnel. The house value was going up and what I owed was going down. I finally bit the bullet and planned to sell the house. Unfortunately the tenants would have to move out. Going up there for the final inspection was a complete and utter shock. The house was filthy. Inch thick grease in the kitchen , inch think dirt in the bathrooms. Carpets and beds ruined. Sockets pulled out of the walls. The level of dirt was sickening . It’s taken 3 grand now just to get the house up to a sellable condition and the only recourse I had was to take the deposit money from the tenants. Which they had the nerve to argue about. I’m rambling a bit now , but my point is. Not all landlords are Ebenezer Scrooge type characters . Sitting at home in their robes counting money. Bar covering my mortgage, which I was grateful for. I didn’t make a single penny on the whole transaction. Not that is was ever my plan. There are a huge amount of us getting into it out of utter necessity. Who can’t wait for the day they can pay the bank what they owe and walk away. I take exception that being a landlord makes me an automatic scumbag. This is fair enough. But take a step back, in what world should you be able to buy a house and make a profit after tax and expenses? It seems like in a situation like that, no one would ever rent unless they were completely trapped. And rents would have to be so high as to continue to trap renters by preventing them from ever being able to save a deposit to buy themselves. That would be a terrible situation for a society to find itself in. Not automatically no but before you sold up, how much were you charging each tenant and how many were they? My point is that the higher the rents the less care the tenants will take because they know they are being gouged. I spoke to someone the other day who lives in a shared house. 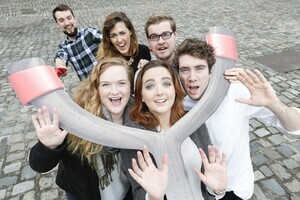 All Grand Canal dock tech types who have been there for a number of years. The landlord does absolutely nothing for them and they cover any work needs done themselves. The landlord has not asked for one rent hike and they are happy with this arrangement. The place is in good nick from what I have been told and I do believe this person. Excellent! 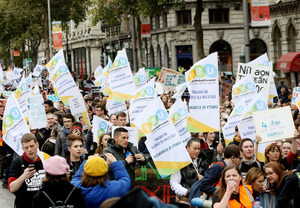 The young people of this country need to show the establishment that they are a force to be reckoned with. Keep the momentum building. I might be a bit out of the loop, but is most of the venom directed at landlords? If so, why? 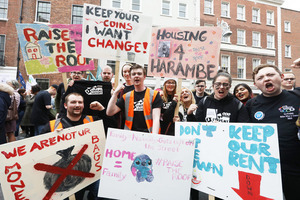 I’m a landlord and due to the anti-landlord regs etc in Ireland, I’m selling up i.e. taking 3 houses / 10 double bedrooms off the rental market. This will only hurt renters, but many like me cannot continue. 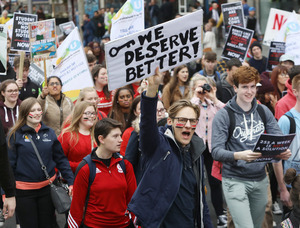 I’m not playing the poor mouth – rather trying to highlight that some of these protests might not have the desired effect i.e more and cheaper rental accommodation with better tenant rights. That means there’ll be three family homes for sale. Good. 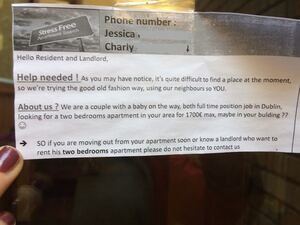 Let’s hope they’re bought by actual familes rather than landlords. Life is not a game of Monopoly. Why does anybody need to own more than one house? It’s pure greed in my opinion. Bought by familes and removed from the rental market, reducing supply. Reducing rental supply – yes. Those properties, if purchased by families or individuals in need of housing, will reduce the demand for rental properties. The house isn’t going anywhere, and unless the property owner decides to keep it vacant for whatever reason or literally demolished, then the housing supply is unchanged. Actually you are playing the poor mouth. Pretty sure your mortgages are way down on when you took them out and you had little social conscience when you greedily elbowed aspiring home owners out of the way back then. ABW has been benevolent and has been doing the world a favour by letting out those three extra houses. And the thing is, all his tenants have absolutely nothing to show for their rent. Meanwhile ABW’s bank balance, I’m sure, has swollen. People buying up more than their share of properties in the first place is what has contributed to this crisis. Buying up properties became a national pastime for some during boom time. It suits FG to let people believe that its the one property landlords who are the problem. Some are of course, but many are not. 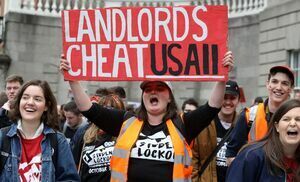 We all know who the real scum landlords are and they wear sharper suits than some Garda Sergeant with a second property. Is that not a tax on rent paid? If it didn’t cost so much to buy a house, because of the lack of supply, brought on (in part) by immobile tenants who can’t afford to buy because of etc., then new mortgages wouldn’t be so high, causing landlords to charge high rents to cover same, which in turn….. So cheaper houses would mean lower rents, but also lower mortgages which would mean landlords not trying to serve unrealistic debts by charging high rents but actually being able to clear a decent living from affordable housing. ‘Tis like a tragic roundabout. That is based on the assumption that most landlords are in high debt, they are not. This is the biggest transfer of wealth since the foundation of the state. Some people are absolutely creaming it, including the government through tax. But no, tax relief for renters would be expensive apparently. Maybe there is some journalist or accountant, or preferably both together, who could sit down and calculate how much tax the government has gained from these rent increases over the past ten years. Is that really too much to ask? Not looking at any one involved in BS at all. No, really. All the landlords are now vulture funds and REITs. And they pay no tax. 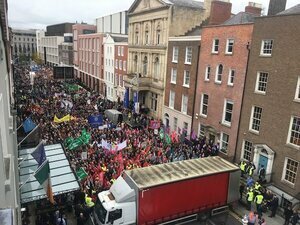 I very much doubt if the pension funded investments are even more than 5% of the Irish rental market. I may be wrong and if I am then I would like someone to show me how and where I am wrong. I done a search of Daft (D7-D8) today. No immigrants could afford those prices unless they were hookers or rent boys. I am pretty certain that the problem is mainly Irish people exploiting Irish people which… is an uncomfortable truth. So wait a minute….the government pays out x millions in HAP each year, a percentage of which is hauled back in tax. 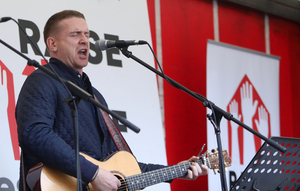 If, instead of paying it to private landlords, we were to build houses and charge a social rent, that might, for the sake of argument, be equivalent to the tax take from HAP recipient landlords, then the bottom line might end up the same…..
…..so why don’t we do that? yeah, I know. Sat, you are right. The government should invest in houses and house people directly instead of paying HAP to private landlords. And once it’s up and running it costs the same. But there is a problem. In the short term you are paying on the double – to build new homes and simultaneously pay HAP. It is the same problem that renters face. A mortgage is less than rent in many cases. SO why don’t renters just buy? But they need the deposit – and can’t afford both deposit and rent. A couple looking to save €40K is huge. A government looking to 40bn is equally massive. Saying that, they do need to start, even if it is ‘only’ 1000 homes this year.